One of many hundreds of stranded barnacles on the beach , some still alive but most desiccated and dead. "Dosima Fasicularis " . 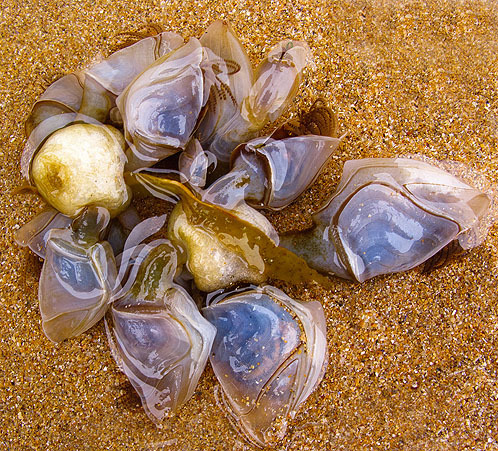 Buoy - Making Barnacle , is a stalked barnacle that can either attach to a piece of debris floating at the surface of the sea or in the absence of suitable substrates can generate its own float. This float has a texture like polystyrene and usually supports a small colony of barnacles by the time it washes up . Like other barnacles, it bears plates (in this case five large ones) although the stalk is naked. The shell plates are thin and papery.